Herbert Reininger is a Creative Director, longtime TEDster and has worked with TEDxPSU at Pennsylvania State University since they started in 2010. They are one of the first 100 TEDx’s and annually produce an event for 800 with 2,000 viewing online. He helped with the design of the event until 2014 when he took over the license. Herbert works as the Faculty Advisor, with a revolving door of students each school year, on the team. Over the years they’ve developed a technique of interviewing, shadowing and mentoring that has the effect of providing continuity across years. One of the benefits of working on this TEDx is that the entire team travels to TEDxMidAtlantic three months before their event to be inspired and study from a TEDx that is acknowledged as being one of the best. Herbert was hooked on TED in 2006 when the first videos went online (where have we heard that before?). In 2008 he started showing TED talks at pizza nights, and have students discuss the Talks, with him facilitating the discussions. This could be viewed as what the original TEDx mission was intended to promote. 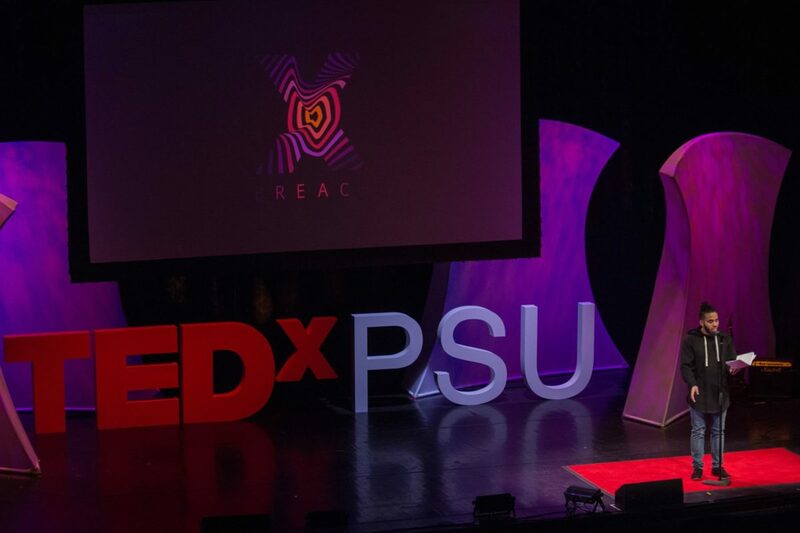 Seven main events at PSU and he has traveled to many TEDx events around the world. We met last summer at the TEDSummit in Banff. He spends a lot of time mentoring TEDx organizers during the year. He thinks that the way they’ve managed to optimize the challenge of a constantly revolving team has helped them systematize their efforts. He’s the licesnsee, but not the organizer. There’s a new curator each year. The curator comes from a team that’s previously produced an event. The teams pass knowledge and experience to one another over a two-week period each Spring. There are 15 people on the team each event. Producing – he’s a Creative Director and does the set design while overseeing the entire team as a Faculty Advisor. He’s also adept at Organizing. Don’t forget his Austrian accent. “There’s a whole herd of dragons.” The biggest though is the annual hunt for interesting speakers. “If you commit now, think carefully. You can’t change your mind. There’s no going back.” Team members count on each other and need to know that your commitment can be trusted. TEDxGlobal in Tanzania. He’d love to go to Africa. Stage design. Literally. He loves doing this each year. We talked about how you can do this with lights and simple geometric shapes.